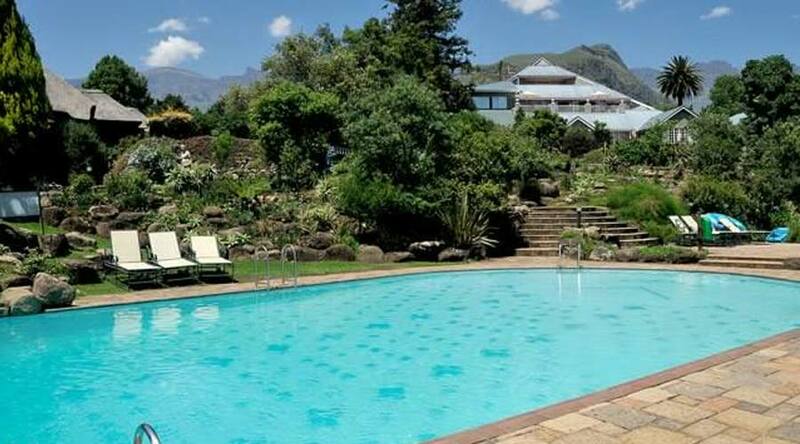 A superior Drakensberg Mountain Resort Hotel deep in the Drakensberg mountains of KwaZulu-Natal, South Africa. 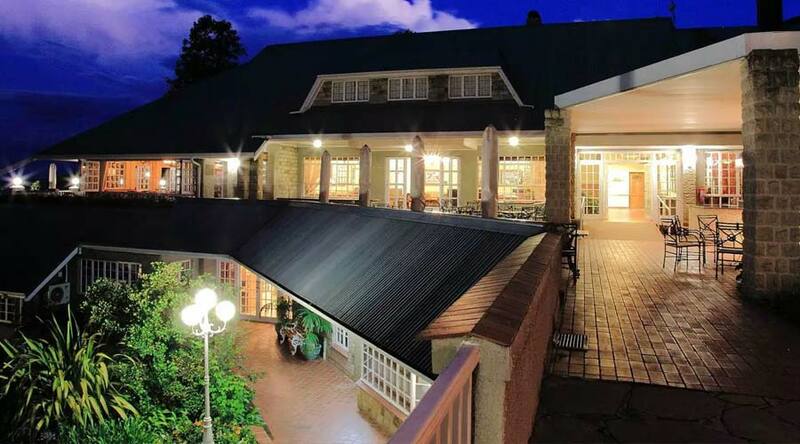 Cathedral Peak Hotel is set in the beautiful Ukhahlamba Drakensberg Park (World Heritage Site) surrounded by the majestic Drakensberg mountains in uninterrupted natural beauty. Whether you are with us on holiday, conference, or to enjoy an unforgettable honeymoon after your romantic wedding in our chapel, our service and hospitality assure you a comfortable and memorable stay. Surrounded by some of the world's most stunning scenery, this KwaZulu-Natal hotel resort accommodation also enjoys the privilege of an abundance of birdlife, plants and rock art. 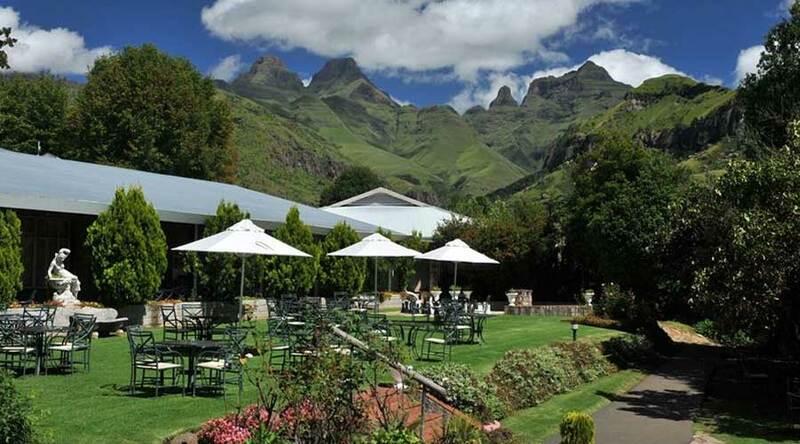 These natural treasures, together with Cathedral Peak Hotel's many sport and recreational facilities, lure holiday-makers to this award-winning hotel time and time again. 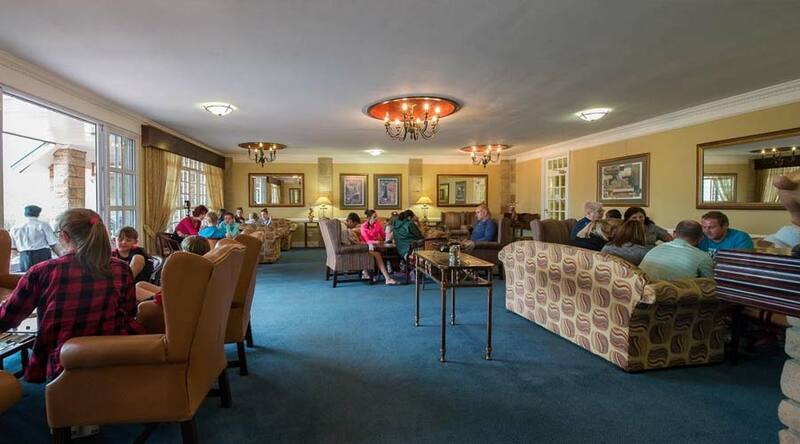 Just 250km from Durban and 400km from Johannesburg, the famous Cathedral Peak Hotel is easily accessible to its many visitors from all over South Africa and abroad. 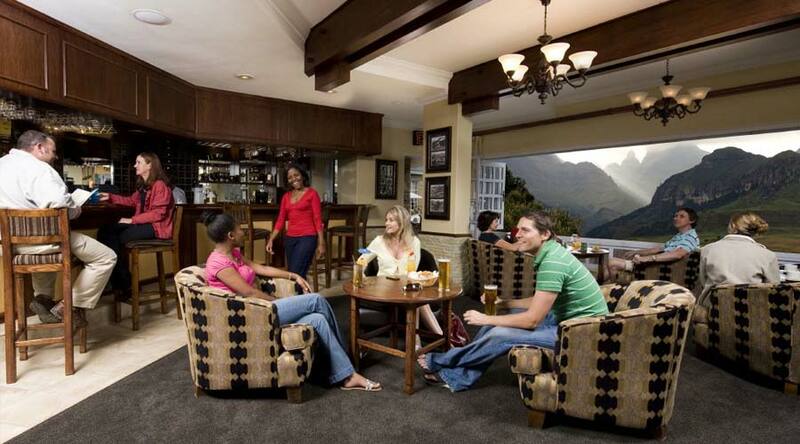 Cathedral Peak Hotel offers a wide variety of accommodation. The comfortable en-suite standard rooms and standard thatched rooms are ideally situated in the beautiful hotel gardens and can accommodate between 2 & 4 guests. Very spacious deluxe suites have a private verandah and garden and the Inter-leading family deluxe rooms are able to accommodate up to 4 guests in either twin or double beds. All hotel rooms provide tea/coffee making facilities, heaters, telephones, televisions and en-suite bathrooms with both bath and shower. 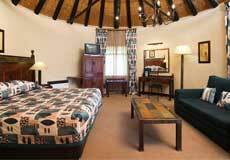 The well-appointed executive/honeymoon rooms are set in secluded gardens. Each suite has been individually decorated to enhance its appeal and create a luxurious, intimate ambience. 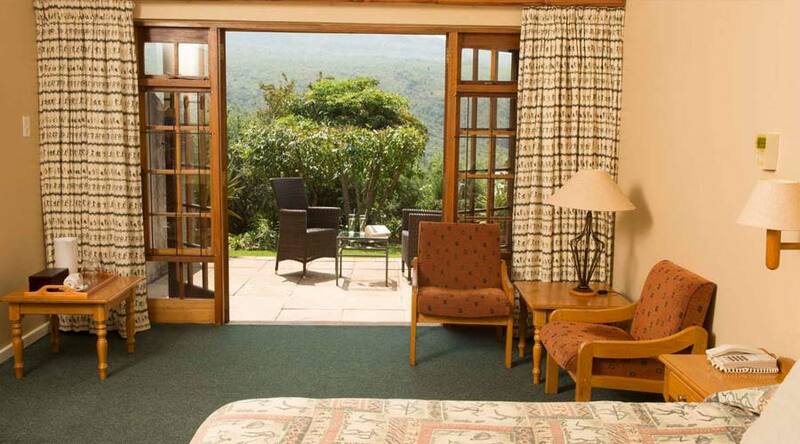 These suites all boast a large four poster bed, television, telephone, mini bar fridge, electric fireplace, underfloor heating, spa bath, and private verandah with breathtaking mountain views. 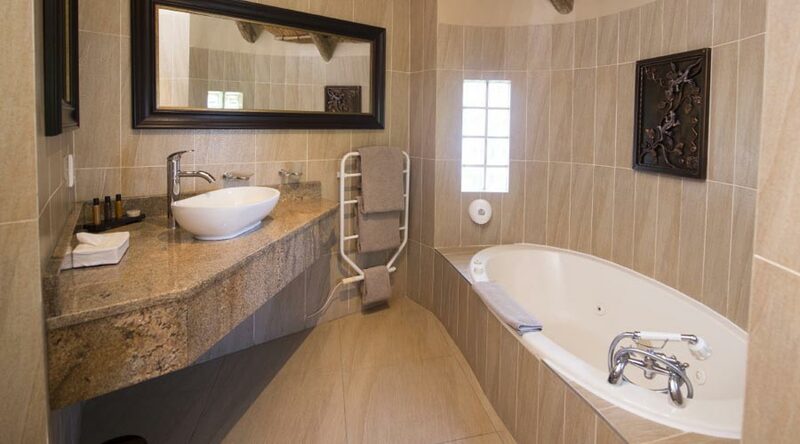 The Mponjwane Presidential Suite boasts a fireplace, spa bath, steam bath, under floor heating, two televisions with full DSTV, air-conditioning, electric curtains opening onto a private verandah with spectacular mountain views. 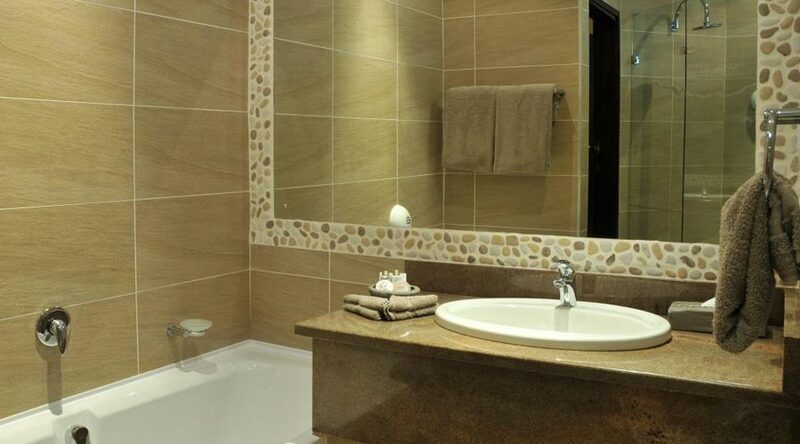 The suite is decorated in warm textured hues with high quality finishes and sophisticated lighting. The natural surroundings are introduced into the décor and the guests will have the use of a private golf cart for the duration of their stay. 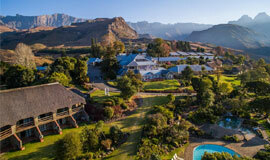 There is an abundance of activities at Cathedral Peak Hotel to suit both young and old. The hotel offers a variety of outdoor activities including free daily guided hikes (incl. walks to Bushman paintings and specialist birding hikes with a qualified guide) horse-rides, Mountain bike trails (own bikes required), jogging route, tennis, squash, bowls, outdoor chess, beach volleyball, quad bikes, badminton, floodlit mini-adventure golf, 10m climbing tower, heated & cold swimming pool and fly fishing. In addition, the immaculate 9-hole golf course situated on the hotel property offers alternate tees for an 18-hole game. The club house boasts rest rooms, a lounge area, pub (Philip's Pholy) and a terrace with spectacular mountain views - the perfect 19th hole. The length of the course is 5542m and the course is graded a par 70. 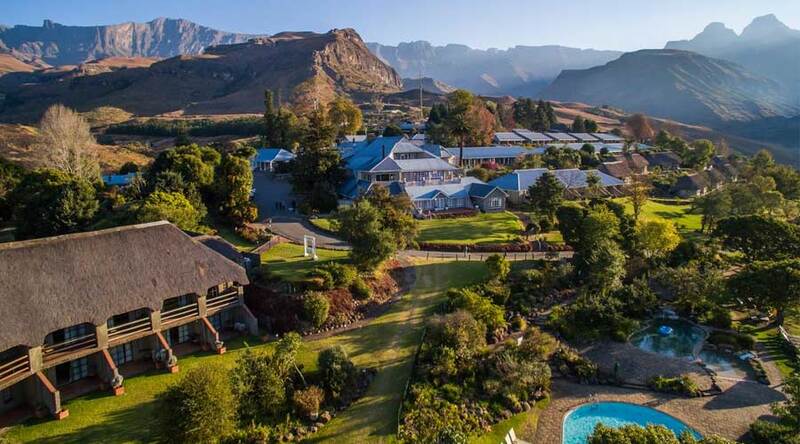 Cathedral Peak Hotel is also a welcome family retreat with a host of children's facilities including pony rides, a children's playground, jumping castle, heated paddling pool and trampoline. The Hotel's many indoor facilities include table tennis, a games room, fully equipped gym with steam bath and a beauty therapist where you are encouraged to relax and be pampered with one of the many treatments available from Peak Performance Vitality Centre. The hotel also offers a variety of hikes that cater far different fitness levels. Rates on request. Click here for more info. The elegant hotel dining room offers an extensive buffet of superb culinary creations at both breakfast and dinner. All meals are personally overseen by the hotel's team of top-class chefs. A separate children’s dining room provides younger children with nutritious meals, toys and entertainment and the opportunity of meeting new friends (babysitters are available on request). After dinner, enjoy a game of pool, darts or sport on the big screen in the well-known Harry's Bar or relax in the comfort of Albert's Cocktail Bar with the ambience of a roaring log fire. 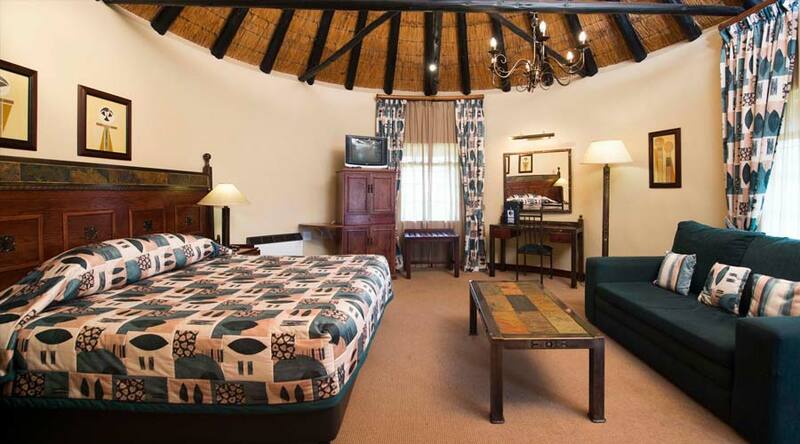 These open-plan thatched rooms are ideally situated in the beautiful Hotel gardens. Each en-suite room offers television, telephone, fan, heater, tea/coffee making facilities, a mini-bar fridge (stocked on request) and a king-sized bed and sleeper couch (note, shower is overhead in the bath, with sleeper couch there is no space for an additional bed). Whisk your family away to Cathedral Peak in the Drakensberg mountains these school holidays and bring your kids along for free! For bookings between the 15th March and the 18 April 2019, all children under the age of 12 sharing with 2 adults for 3 nights or more, stay at the hotel, fully inclusive, FOR Free. 2 night minimum policy applies on weekends. Take the N5 from Harrismith toward the Free State. Not far out of the town turn left onto the R712, and after about 8km, turn left again onto the R74. This route will take you past the Sterkfontein Dam, and down the scenic Oliviershoek Pass. Continue to Bergville. Just beyond Bergville, on the R74 to Winterton, turn right at the Cathedral Peak Hotel sign. After about 16km turn right to Emmaus/Cathedral Peak.It is approximately 31km to Cathedral Peak. On the N3, about 26km beyond the Estcourt glide-off from the N3 freeway (and beyond the turnoff to the Central Berg Resorts) take the Bergville/Colenso off-ramp. Turn left onto the R74 to Winterton/ Bergville. Turn left onto the R600 in Winterton, and turn right after approximately 1km to Cathedral Peak. After 11km there is a T-junction. Turn right and almost immediately left to Emmaus/Cathedral Peak. It is about 31km to Cathedral Peak Hotel from there.